Would you believe that each one of you is using at least 20 microcontrollers in your house??!! Well, that’s a fact. There are more than two billion microcontrollers being produced every year. Almost everybody in developed as well as developing nations cannot think of a day without using microcontrollers. The microcontroller is an embedded computer chip that controls most of the electronic gadgets and appliances people use on a daily basis, right from washing machines to anti-lock brakes in cars. Now, how did this idea of a microcontroller emerge? What is the invention story of this powerful chip? It was during 1970 and 1971 when Intel was working on inventing the world’s first microprocessor, that Gary Boone of Texas Instruments was working on quite a similar concept and invented the microcontroller. Boone designed a single integrated circuit chip that could hold nearly all the essential circuits to form a calculator; only the display and the keypad were not incorporated. 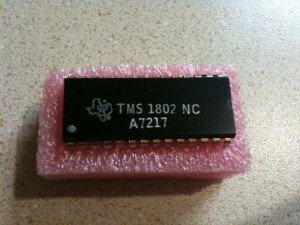 Surprisingly, this exceptional breakthrough in the field of electronics and communication was rather given a mundane name of TMS1802NC; however, the device wasn’t ordinary. It had 5000 transistors providing 3000 bits of program memory and 128 bits of access memory!! So, it was possible to program it to perform a range of functions. It is a known fact that requirements and needs lead to inventions and discoveries. Business at the Texas Instruments MOS Department was mostly a custom business wherein companies like desktop calculator manufacturers came to TI with a set of specific requirements. TI converted those specifications to a chip set, normally four, five or six chips to execute or implement the specifications for popular companies like Canon, Olympia or Olivetti. For these companies, it was really amazing that TI provided this ultimate service of compressing so many units on to just four or five or six chips because the previously used technology called the TTL would use hundred to two hundred chips. No wonder the business was doing great. It was during these times that Gary Boone was with a few other people making extensive research within the country as well as flying to Germany, Italy and other countries. They were trying to understand the needs of the new customers and work on it. Boone was literally bored after doing this a number of times. Besides, since their previous projects were all successful and they had a flock of satisfied customers, a new set of customers required them to do the same work they did to someone else the previous year. Thus, there was a significant demand for more and more of these projects. A common rule at Texas was “one riot, one ranger” which means “one chip, one engineer.” So Texas Instruments that had about twenty MOS design engineers deployed three or four of these at one project at a time. And, it took about six months to complete one project. Therefore, business capacity was the number of engineers divided by the number of chips, once in every six months. Though the requirements of these projects differed in terms of detail, the major principle and the overall function was quite identical. So, the engineers were really tired of doing these monotonous projects. They were working for long hours and they felt a better way to accomplish these projects should be explored. Boone and the other engineers ended up thinking of a matrix of customer needs one way and chunks of circuitry or functional blocks the other way. Boone could find out the commonality and he, along with the others considered simulating the thought, “Okay, now if I had these many bytes of data storage, and I had this many bytes of program storage, and I had these many bits of keyboard scan interface, then that would cover all of the specification I know about, maybe.” As a result of this excellent thought, came the first TMS 100 microcontroller chip. Isn’t it truly exciting to know that this breakthrough device came out of boredom, a vision of commonalities and high demand that were being inadequately served by deploying large teams with many chips?! One crucial technical aspect was that the design technology in those days was quite inefficient in terms of how silicon was utilized. Different architectures had to be chosen so that the regular structures and memory had to be emphasized; besides, pitch-matching also had to be given emphasis so that a bit-slice concept wherein everything matching to each of the four bits of a four bit adder was laid out to be of the same dimension in physical terms. Only then it would fit together and match in pitch. Ultimately, another factor of three or four in terms of silicon density would be achieved. In spite of the constraint of architectures that were primarily memory and pitch-match oriented, the then invented microcontroller was much better than the previous TTL technology and ended up with much efficient use of silicon. This microcontroller was used at the Texas Instruments internally in its calculator products between 1972 and 1974. The device was further refined over the years. TI offered this microcontroller for sale to the electronics industry in 1974. It was made available in different configurations of RAM and ROM sizes. By 1983, nearly 100 million TMS 1000 had already been sold. Year after year, microcontrollers were seeing tremendous growth and usage. It was during the 1990s that advanced microcontrollers with electrically erasable and programmable ROM memories such as the flash memory started flooding the electronics market. The unique feature of these microcontrollers is that they can be programmed, erased and reprogrammed with the help of just electrical signals. A lot of currently used microcontrollers such as the ones available from Atmel and Microchip use the flash memory technology. Today, in addition to the general purpose gadgets, unique microcontrollers are being created for areas like lighting, automotive, communications, and low-power driven consumer goods. The present day microcontrollers like AVR, and PIC have become smaller and sleeker yet more and more powerful. For instance, there are so tiny microcontrollers available, small and cheap enough to be used in simple products like toothbrushes and toys.